Here are some snazzy birthday facts about 10th of March 1957 that no one tells you about. Don’t wait a minute longer and jump in using the content links below. Average read time of 10 minutes. Enjoy! What day was my birthday Mar 10, 1957? March 10, 1957 was a Sunday and it was the 69th day of the year 1957. It was the 10th Sunday of that year. The next time you can reuse your old 1957 calendar will be in 2019. Both calendars will be exactly the same! This is assuming you are not interested in the dates for Easter and other irregular holidays that are based on a lunisolar calendar. What day was March 10 this year? There are 322 days left before your next birthday. You will be 63 years old when that day comes. There have been 22,689 days from the day you were born up to today. If you’ve been sleeping 8 hours daily since birth, then you have slept a total of 7,563 days or 20.71 years. You spent 33% of your life sleeping. Since night and day always follow each other, there were precisely 769 full moons after you were born up to this day. How many of them did you see? The next full moon that you can see will be on May 18 at 21:13:00 GMT – Saturday. Fun stat: Your first one billion seconds (1,000,000,000) happened sometime on November 16, 1988. If a dog named Sky-Bonito - a Maltese breed, was born on the same date as you then it will be 268 dog years old today. A dog’s first human year is equal to 15 dog years. Dogs age differently depending on breed and size. When you reach the age of 6 Sky-Bonito will be 40 dog years old. From that point forward a small-sized dog like Sky-Bonito will age 4 dog years for every human year. View the complete list of March 10 celebrity birthdays. Who are the famous March 10 birthdays? Here’s a short list of famous people in history who were born on Mar 10. View the complete list of March 10 famous birthdays. What happened on my birthday – Mar 10th? Roman Emperor Maximian concludes his campaign in North Africa against the Berbers, and makes a triumphal entry into Carthage. Louisiana Purchase: In St. Louis, Missouri, a formal ceremony is conducted to transfer ownership of the Louisiana Territory from France to the United States. The Treaty of Guadalupe Hidalgo is ratified by the United States Senate, ending the Mexican–American War. El Hadj Umar Tall seizes the city of Ségou, destroying the Bamana Empire of Mali. The Courrières mine disaster, Europe’s worst ever, kills 1099 miners in Northern France. Some provinces and cities in the Philippines are incorporated due to the ratification of Act No. 2711 or the Administrative Code of the Philippines. In Memphis, Tennessee, James Earl Ray pleads guilty to assassinating Martin Luther King, Jr. He later unsuccessfully attempts to retract his plea. Formation of the Irish Army Ranger Wing. In Haiti, Prosper Avril is ousted 18 months after seizing power in a coup. View the complete list of March 10 historical events. What does my birthday March 10, 1957 mean? 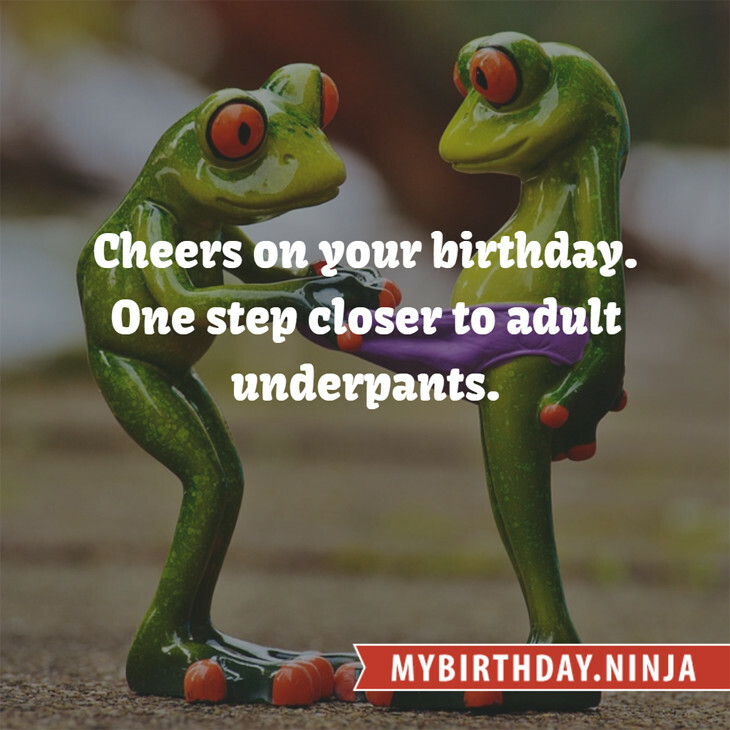 Your birthday numbers 3, 10, and 1957 reveal that your Life Path number is 8. It represents experience, authority and endeavour. You are gifted with natural leadership and the capacity to accumulate great wealth. The following celebrities also have the same life path number: Buddy Rogers, Frédéric Choffat, Kang Je-gyu, André the Giant, Nao Oikawa, Gabe Kaplan, Murphy Dunne, Layne Staley, Rossano Brazzi, Kodi Smit-McPhee. 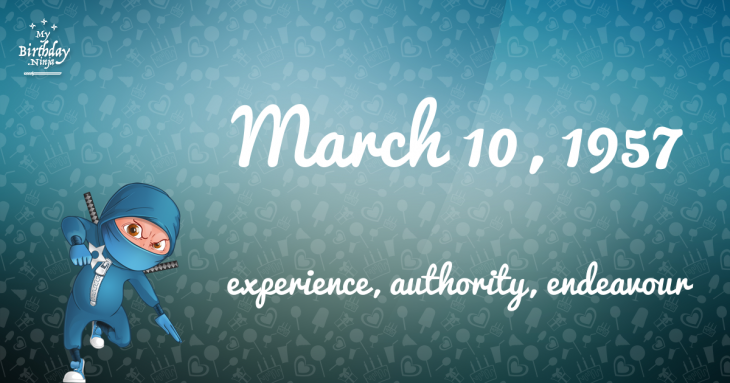 What is the birthday horoscope for Mar 10, 1957? The Western zodiac or sun sign of a person born on March 10 is Pisces ♓ (The Fish) – a mutable sign with Water as Western element. The ruling planet is Neptune – the planet of dreams and imagination. According to the ancient art of Chinese astrology (or Eastern zodiac), Rooster is the mythical animal and Fire is the Eastern element of a person born on March 10, 1957. What is the birthstone for March 10? Fun fact: The birth flower for 10th March 1957 is Jonquil for affection. What is the Love Match for Mar 10, 1957? When it comes to love and relationship, you are most compatible with a person born on June 26, 1951. You have a Love Match compatibility score of +125. Imagine being in love with your soul mate. On the negative side, you are most incompatible with a person born on January 20, 1976. Your incompatibility score is -189. You’ll be like a cat and a dog on a love-hate relationship. Arf-arf, I want to bite you. Meow-meow, stay away from me! What is a good birthday trivia for March 10? I do not know how you feel about this, but you were a male ♂ in your last earthly incarnation. You were born somewhere around the territory of Poland approximately on 1000. Your profession was builder of roads, bridges, docks. How many babies were born on March 10, 1957? Base on the data published by the United Nations Population Division, an estimated 102,068,660 babies were born throughout the world in the year 1957. The estimated number of babies born on 10th March 1957 is 279,640. That’s equivalent to 194 babies every minute. Try to imagine if all of them are crying at the same time. What is the popular baby name on 10 Mar 1957? What’s your bizarre Florida Man story? The #FloridaManChallenge is breaking the Internet and social media. Some crazy men, women, or creatures from the Sunshine State are making headlines every day of the year including your birthday. Try this fun exercise. Pick your search engine of choice and type in “florida man March 10” and see what kind of wild news headline you will get. This viral craze started in 2013 and gets resurrected now and then. The latest was from Tumblr and found its way to Twitter. As they say, the rest is history. Here’s a quick list of all the fun birthday facts about March 10, 1957. Celebrities, famous birthdays, historical events, and past life were excluded. Try another birth date of someone you know or try the birthday of these celebrities: February 13, 1949 – Judy Dyble, English singer-songwriter and pianist (Fairport Convention and Giles, Giles and Fripp); May 8, 1981 – Mich Dulce, Filipino actress, singer, and fashion designer; May 10, 1968 – Erik Palladino, American actor and producer.